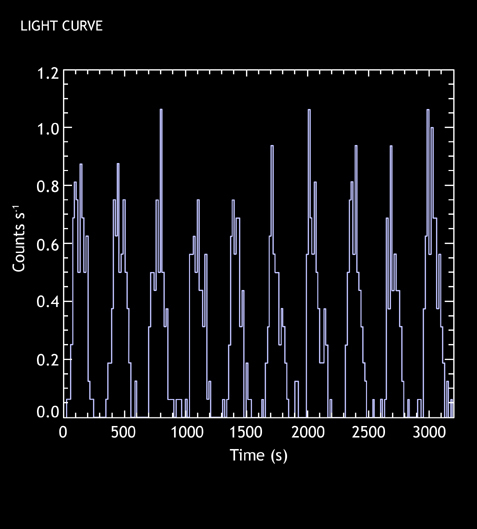 Chandra data (above, graph) from observations of RX J0806.3+1527 (or J0806), show that its X-ray intensity varies with a period of 321.5 seconds. This implies that J0806 is a binary star system where two white dwarf stars are orbiting each other (above, illustration) approximately every 5 minutes. The short orbital period implies that the stars are only about 50,000 miles apart, a fifth of the distance from the Earth to the Moon, and are moving in excess of a million miles per hour. According to Einstein's General Theory of Relativity, such a system should produce gravitational waves -ripples in space-time - that carry energy away from the system at the speed of light. Energy loss by gravitational waves will cause the stars to move closer together. X-ray and optical observations indicate that the orbital period of this system is decreasing by 1.2 milliseconds every year, which means that the stars are moving closer together at a rate of about 2 feet per day. Coordinates (J2000) RA 08h 06m 23.20s | Dec +15° 27´ 30.20"
References T. Strohmayer, 2005 Astrophys. J. Letters (in press); see also astro-ph/0504150.